The opposition Jumhooree Party spokesperson Ali Solih has been accused of unlawfully leasing an island to a company owned by a cabinet minister during his tenure as the minister of state for fisheries and agriculture. The anti-corruption watchdog said Solih had leased an uninhabited island in Shaviyani Atoll to a company owned by then-minister of health Mariyam Shakeela. The constitution bars cabinet ministers from actively engaging in a business, buying or leasing any state property or from having financial interests between the state and another party. The Anti-Corruption Commission (ACC), in a report released today, said Solih had abused his authority in leasing the island to Shakeela’s company. Solih was appointed to the fisheries ministry by former president Dr Mohamed Waheed in 2012. The ACC said Solih had not consulted the fisheries ministry’s legal department in signing a contract. The department had informed Solih the transaction was illegal in a memo, but he told the ACC he was not aware that a memo had been issued. Solih did not cancel the contract even when he found out the company belonged to the health minister, but considered transferring the contract to a new company, the ACC said. The managing director of the new company was a shareholder in the company the island was first leased to, the ACC said. The act constituted abuse of authority to confer undue advantages and if convicted, is punishable with three years in jail, house arrest or banishment. President Abdulla Yameen appointed Shakeela as health minister, but she lost her cabinet portfolio when pro-government MPs rejected her nomination in a cabinet shuffle in August. It is not yet clear if the ACC will seek to prosecute Shakeela for continuing to hold shares in a company as health minister. Speaking to Minivan News today, Solih said he was not aware whether a cabinet minister held shares in the company the island was leased to. “It was not my responsibility to find out who owned shares in the company, but as soon as I found out that this contravened with the law, I asked the legal department to look into it,” he said. “This is the government’s method of intimidating people who are working against their tyrannical regime,” he added. The JP had split from the ruling coalition in January citing authoritarianism. Senior members of the party have launched an anti government campaign along with the main opposition Maldivian Democratic Party and the Adhaalath Party. Two senior JP officials are now facing prosecution on criminal charges. JP deputy leader Ameen Ibrahim and JP council member Sobah Rasheed have been charged with terrorism for allegedly inciting violence during an anti-government demonstration on May Day. The charges under the 1990 Anti-Terrorism Act carry a sentence of between 10 to 15 years in prison. The pair are abroad at present. 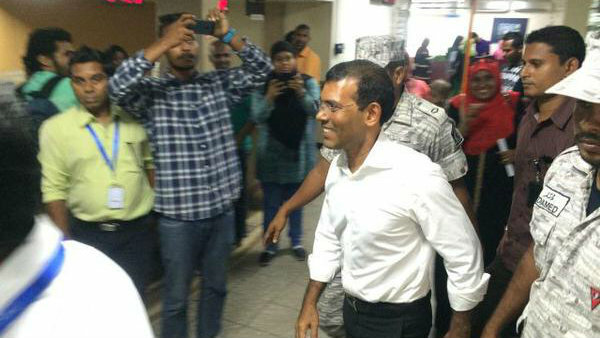 Sobah said he is seeking political asylum. JP leader Gasim Ibrahim has been in Bangkok since late April. The tax authority in May froze Gasim’s Villa Group’s accounts claiming the company owed the government US$90.4million in unpaid rent, fees and fines. 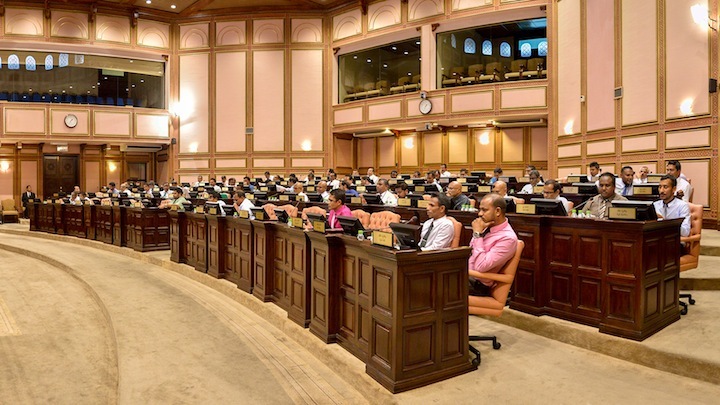 The parliament today accepted for consideration a constitutional amendment proposing an age limit of 30 to 65 years for the president and vice president. Government-aligned MP Mohamed Ismail’s bill has fuelled speculation of President Abdulla Yameen planning to replace Vice President Dr Mohamed Jameel Ahmed with tourism minister Ahmed Adeeb, who is now 33 and ineligible for the position. Presidential candidates must be 35 years of age, according to the constitution. He noted that 65 years is the retirement age in the Maldives. A 70-year-old or 80-year-old would find it difficult to fulfil the responsibilities of the office, Ismail contended. 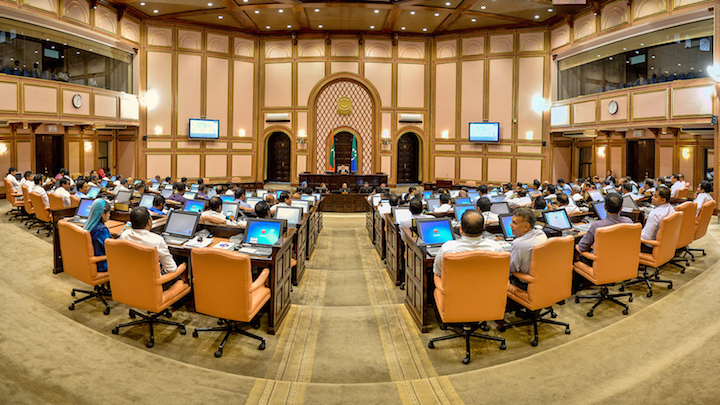 The ruling coalition will need the backing of the opposition Maldivian Democratic Party (MDP) or Jumhooree Party (JP) MPs to pass the amendment. Several JP MPs voted in favour of the bill. 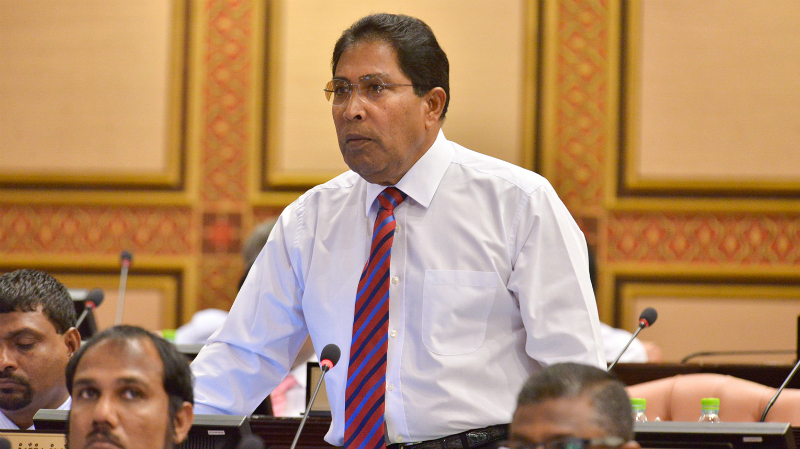 If passed, the amendment will bar JP leader Gasim Ibrahim from contesting the next presidential election. The business tycoon will be 66 in 2018. During the preliminary debate today, opposition MPs argued that it should be up to the public to decide whether a presidential candidate is too young or old for the presidency. MP Ibrahim Mohamed Solih, parliamentary group of the MDP, said he favoured lowering the age limit to 18 years, but objected to the 65-year age limit. MDP MP Imthiyaz Fahmy said the constitution should not be amended to serve the interests of an individual. But PPM MPs denied that the amendment was “tailor-made” for Adeeb. JP MP Ali Hussain said constitutional amendments should only be proposed after reaching a consensus among political parties. No democratic country has an upper age limit for the president, he said. PPM MP Abdul Raheem Abdulla said amending the constitution might be necessary “under some circumstances” to allow the president to replace a “disloyal” vice president. “I’m not saying at all that we are trying to bring a particular person to the vice presidency. But if it has to be done, the PPM parliamentary is ready,” he said. Last month, newspaper Haveeru suggested that the ruling coalition might also amend the constitution to authorise the president to appoint or dismiss his deputy. 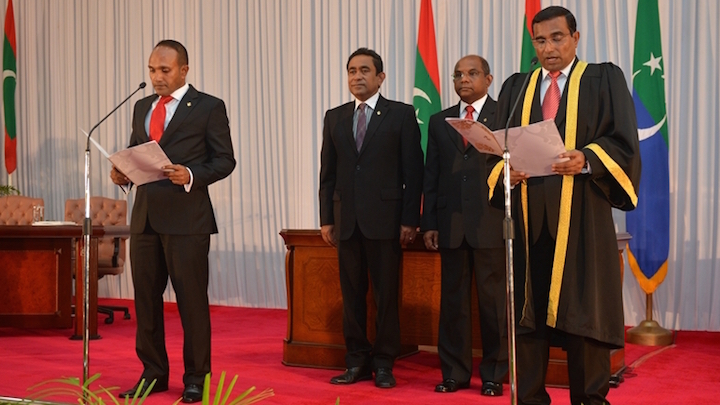 The relationship between President Abdulla Yameen and Dr Jameel is reportedly under strain. 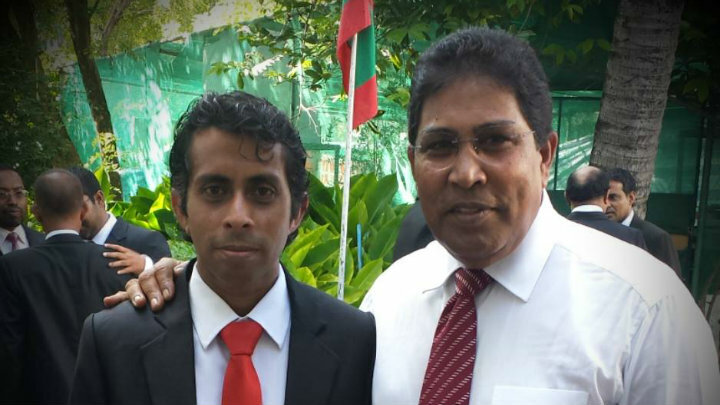 His cousin, Mohamed Maleeh Jamal, was dismissed from the cabinet last month. The government did not provide a reason for the dismissal.